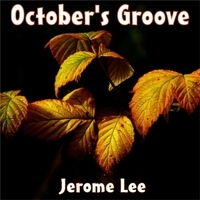 “October’s Groove” is an up tempo instrumental single from veteran bassist/songwriter Jerome Lee that celebrates the vibrant month of October in our lives. “October’s Groove” is an up tempo instrumental single from bassist/songwriter Jerome Lee that celebrates the vibrant month of October in our lives. The autumn months of September, November, and December all have their own groove; their own tempo in the pulse of our being. October has a groove all its own, with millions of people celebrating in festivals around the world that identify with this special transitory month. You can now take the time to enjoy this special groove composed by Jerome and inspired by the month of October any time during the year when you listen to “October’s Groove”. He has worked with a wide variety of artists that include Oscar winning musician and producer Niki Buzz, talented Japanese vibraphonist Oy Takahashi, modern jazz saxaphonist Tom Borton, 80's funk rockers Urban Artillery, rising neo-soul stars TN'T, rockabilly guitar legend Jackie Lee Cochran, blues masters the King Brothers, early rock and soul pioneer Curtis Knight, and Dutch singer/songwriter Sonny Griffin. In the autumn of 2015, Jerome released a new single titled "The Suits", a fresh soul statement that harkens to the days of early soul music. In the winter of 2016, Jerome released a new single titled "Song for My Family", a solo bass mid-tempo ballad with a lush arrangement that is an ode to a family's love around the world. In January of 2018, Jerome released a new single titled "October's Groove", an up tempo instrumental single that celebrates the vibrant month of October in our lives.